Kelantan Gold Trade 1 Dirham Khas Masjid Beijing Silver coin is now sold as a gift on a card specially made for Beijing Mosque at Rantau Panjang, Kota Bharu. A colourful picture of Beijing Mosque covers most of the front page of the card. The dirham coin itself is produced using pure 999 silver. The obverse face of dirham coin has been stamped with the Kelantanese coat of arms while the reverse side shows the words of Witnessing of Islam in Arabic and the nominal value of the coin in dirham. This gift dirham on the card makes a good present for loved ones and collectors alike, a small saving, a form of Islamic currency for weddings and payment of Zakat. 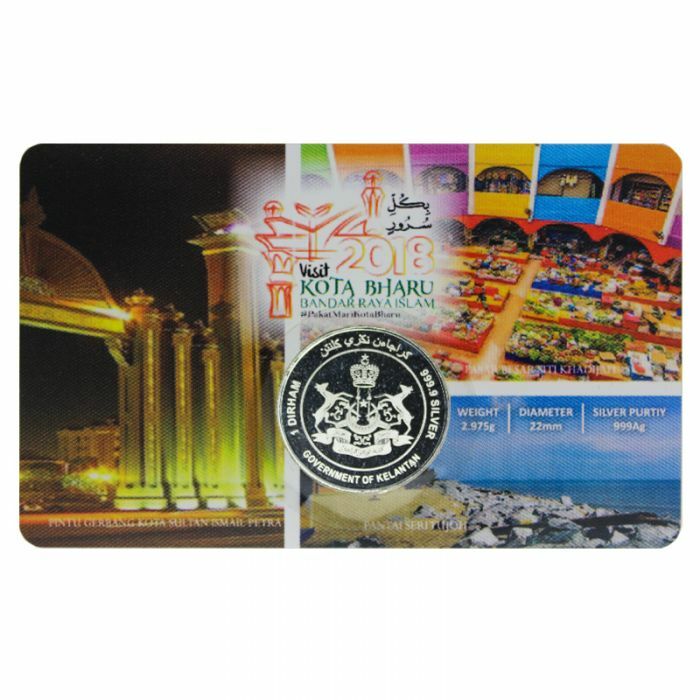 KGT 1 Dirham Kota Bharu 2018 999 Silver Coin is sold as a gift on a card specially made to commemorate the year 2018 as The Year To Visit Kota Bharu, the Islamic City of Kelantan. 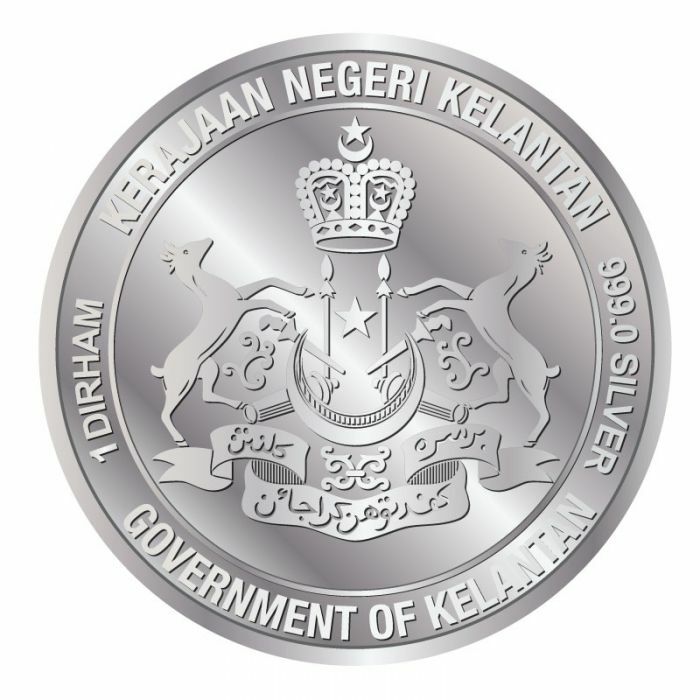 Presenting the Kelantan Gold Trade 1 dirham Silver coin. This dirham coin is produced using pure 999 silver which will make an astounding present for loved ones and collectors alike, or kept as an invesment. Design - This dirham coin have been engraved of the Kelantanese coat of arms, bearing elements of Western heraldry, consists of a crescent and a five-pointed star backed by three sets of weapons. The arms is further supported by a pair of salient muntjacs, topped by a coronet. Dirham coins work well for investment purposes, or as a form of Islamic currency. Oftentimes, Dirham coins are gifted during Islamic rituals like weddings or paying for Zakat. 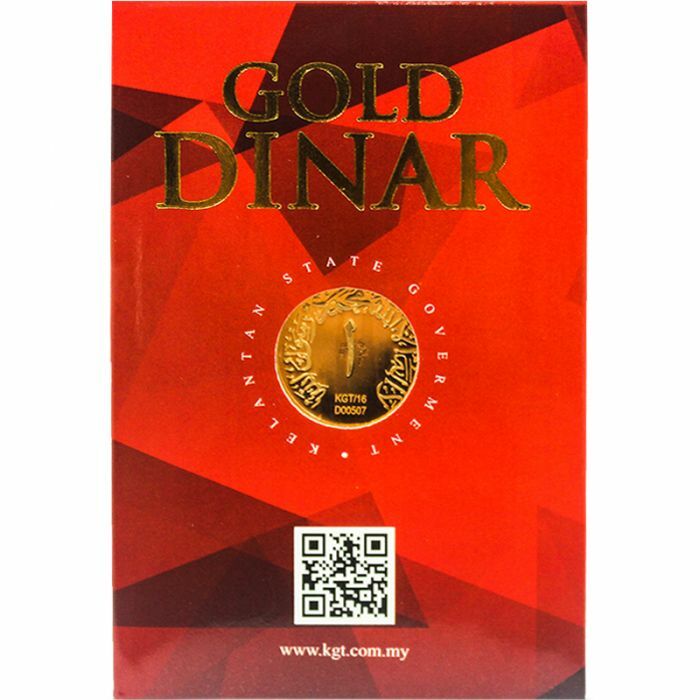 Introducing Kelantan Gold Trade (KGT) 1 gram 999 Gold Wafer Cond: A. This 1 g wafer is glued and pasted by a thin plastic film onto its moisture absorbing paper card. The cut edges of the card are exposed to the wet Malaysian environment and the card is very susceptible to early disintegration. The Crest of Kelantan on the wafer is not very clear and the wafer surface is subjected to the glue that holds the wafer on to its card. Both the wafer and the card keep a serial number. 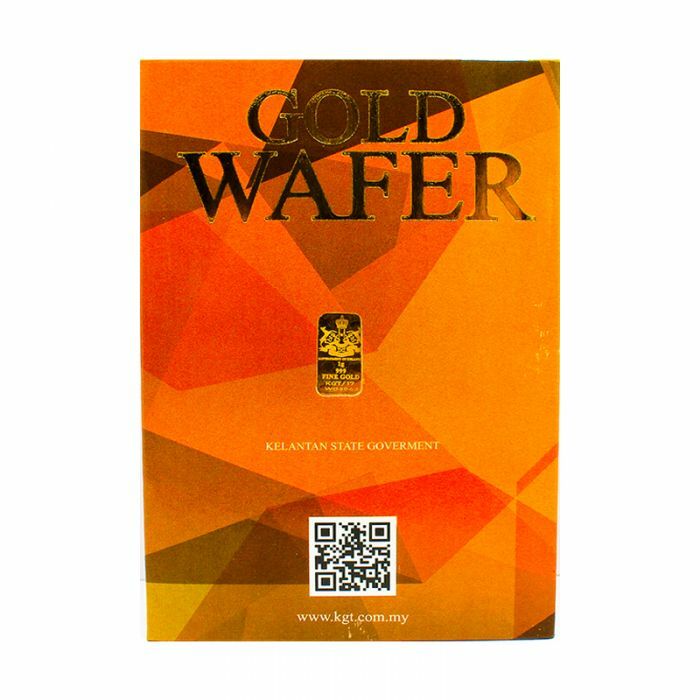 This Kelantan Gold Trade (KGT) 1 gram 999 Gold Wafer Cond: A could be bought as a gift for loved ones and collectors alike. Serial Number:- Both on the card and on the wafer.